NEW YORK—March 1, 2018, will go down as the day New York officially became a Museum City. I don’t mean a city full of great museums, I mean a city that’s become a museum. That was the day the Metropolitan Museum of Art reversed a 148-year policy of free admission and started charging $25 per person. The businessmen who founded the Met in 1870 had made free admission part of its original charter, but now the museum had become a business of its own. Because museums and nostalgia have become the currency of the city. We’re watching one of the great cities of the world, once the center of Western commerce, become a 21st-century version of Vienna, or Venice, or Istanbul, all places that once ruled the global economy but eventually turned into havens for inherited wealth and tourist attractions. Sometime in early 2020 it will cost $11.52 to enter the city of New York in a car—$25.34 for trucks—plus additional surcharges if you use a taxi or a car service. According to the Fix NYC Task Force, commissioned by Governor Andrew Cuomo, this is so that New York can “remain a world-class city and region” by reducing traffic congestion. Of course, as we all know, no policy ever reduces traffic congestion, it just makes it harder to do business. Any company that relies on deliveries will eventually look at that $25.34 entrance fee and start admiring real estate in Jersey City. There’s nothing new about New York hating business, though, even as the New York Stock Exchange was turning Lower Manhattan into the capital of free enterprise. The tobacco industry, led by Lorillard and Philip Morris, was pretty much hounded out of the city in spite of three centuries of local philanthropy that included the donation of the land that makes up the New York Botanical Gardens. The nation’s major airlines were once concentrated within a ten-block radius of Grand Central Terminal, but tax policy and high rents drove them to Atlanta, Dallas, and Chicago. When the 9/11 terrorist attacks forced companies to relocate temporarily to New Jersey, most of them realized how much money they were saving and never returned, and many of the oldest buildings in the Financial District have since been turned into condos. Walmart, the Arkansas-based big-box retailer preferred by bargain hunters all over America, has tried three times and failed three times to open a store in Brooklyn, thanks to local opposition. But none of those fiascos can even remotely compare to the events of February, when activists, union leaders, and politicians combined to drive Amazon out of town. They thought the largest company in the world had failed to earn the $3 billion in incentives already hammered out in a deal to locate a new corporate headquarters in the Long Island City neighborhood of Queens. According to the overly dramatic New York Times, the argument involved “the city’s very identity.” Amazon executives gazed out at a future of endless strife and decided, “Let’s pick one of the 200 cities we passed over for this opportunity, since none of them would (a) break a deal, or (b) complain that we were messing up their city by being there.” When Amazon announced they were pulling out, their critics—especially Congresswoman Alexandria Ocasio-Cortez—were absolutely giddy with joy. Thank God there won’t be 25,000 new jobs in Queens. Amazon was too big for the neighborhood. Good riddance. And then there’s Hudson Yards. 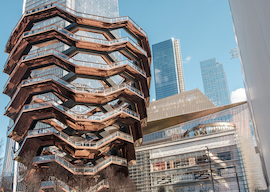 Hudson Yards, for the past 150 years, has been the name of an eyesore railroad yard, but now it’s the name of the largest private real estate development in the world. That’s because of an engineering miracle by which two companies built a platform over 26 acres of rail yards and on that platform built five skyscrapers, a shopping mall, an indoor-outdoor arts center with a sliding roof called The Shed, 4,000 apartments, a school, a park, restaurants presided over by celebrity chefs, and a $200 million sculpture called Vessel, created by the British artist Thomas Heatherwick as a sort of massive jungle gym with an observation deck on its roof. Fifty years ago this sort of project would have been praised for finding a way to build a new neighborhood in a city that’s never had enough space, creating 55,000 jobs, and revitalizing a blighted part of the city. Instead it’s been relentlessly attacked as too “dystopian,” too California, too wealthy, too expensive for the city, too likely to cannibalize other areas by drawing tenants away from Times Square, too much reflective blue glass, “corporate welfare,” “socialism for billionaires,” and something that New York doesn’t need because too many people already live here anyway and the jobs won’t go to deserving locals, they’ll go to carpetbaggers from faraway places like Portland. In other words, take your money and stuff it down some other place’s throat—places like Dallas, and Houston, and Phoenix—places that will take whatever you want to give them because they’re all about Growth. We don’t need growth. We already did that story. We need more double-decker buses, the kind that tourists ride on, to make some money off of people who come here to see what a great city we used to be. The city that once used business to fund museums now uses museums to fund its business. That’ll be $25, please.